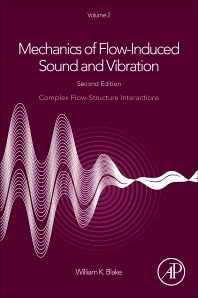 Mechanics of Flow-Induced Sound and Vibration, Volume 2: Complex Flow-Structure Interactions, Second Edition, enables readers to fully understand flow-induced vibration and sound, unifying the disciplines of fluid dynamics, structural dynamics, vibration, acoustics, and statistics in order to classify and examine each of the leading sources of vibration and sound induced by various types of fluid motion. Starting from classical theories of aeroacoustics and hydroacoustics, a formalism of integral solutions valid for sources near boundaries is developed and then broadened to address different source types, including hydrodynamically induced cavitation and bubble noise, turbulent wall-pressure fluctuations, pipe and duct systems, lifting surface flow noise and vibration, and noise from rotating machinery. Each chapter is illustrated with comparisons of leading formulas and measured data. Combined with its companion book, Mechanics of Flow-Induced Sound and Vibration, Volume 1: General Concepts and Elementary Sources, the book covers everything an engineer needs to understand flow-induced sound and vibration. This book will be a vital source of information for postgraduate students, engineers and researchers with an interest in aerospace, ships and submarines, offshore structures, construction, and ventilation.